(Nanowerk Spotlight) Toxicology is an interdisciplinary research field concerned with the study of the adverse effects of chemicals on living organisms. It applies knowledge, methods and techniques from such fields as chemistry, physics, material sciences, pharmacy, medicine and molecular biology. Toxicology established itself in the last 25-30 years as a testing science in the course of efforts of industrial nations to regulate toxic chemicals. Particle toxicology, as a subdiscipline, developed in the context of lung disease arising from inhalation exposure to dust particles of workers in the mining industry. It later expanded to the area of air pollution. With the rapid development of nanotechnology applications and materials, nanotoxicology is emerging as an important subdiscipline of nanotechnology as well as toxicology. Most, if not all, toxicological studies on nanoparticles rely on current methods, practices and terminology as gained and applied in the analysis of micro- and ultrafine particles and mineral fibers. Together with recent studies on nanoparticles, this has provided an initial basis for evaluating the primary issues in a risk assessment framework for nanomaterials. However, current toxicological knowledge about engineered nanoparticles is extremely limited and traditional toxicology does not allow for a complete understanding of the size, shape, composition and aggregation-dependent interactions of nanostructures with biological systems. An understanding of the relationship between the physical and chemical properties of nanostructures and their in vivo behavior would provide a basis for assessing toxic response and more importantly could lead to predictive models for assessing toxicity. "Nanotoxicology is important for the advancement of nanotechnology in a wide-array of applications" Dr. Warren Chan tells Nanowerk. " Studies in this area could lead to the required information to make responsible regulatory decisions. Thus far, most reported nanotoxicity studies have focused on in vitro cell culture studies, however, data obtained from such studies may not correspond to in vivo results. In the future, a full in vivo life cycle characterization framework needs to be formulated wherein systematic evaluation of the size, shape, and surface chemistry of nanostructures, and their correlation to in vivo behavior, is obtained." Chan is an Assistant Professor at the University of Toronto's Institute of Biomaterials and Biomedical Engineering. Together with Hans Fischer, a PhD student in his group, he published a review article in the December 2007 issue of Current Opinion in Biotechnology in which he describes the assumptions and challenges in the nanotoxicity field and provide a rationale for in vivo animal studies to assess nanotoxicity ("Nanotoxicity: the growing need for in vivo study"). The two scientists argue that the development of predictive models of nanostructure toxicity requires a systematic mapping of the fate, kinetics, clearance, metabolism, protein coating, immune response and toxicity of nanostructures to the nanostructure’s physical properties within a life cycle model. 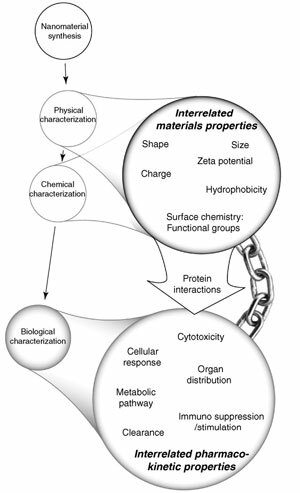 The focus of Chan's article is to provide a review of the in vivo activities of nanostructures and define the link between these studies and a better toxicological understanding of nanostructures. He also provides a brief description of nanostructures, their interactions with cells in in vitro cell culture systems, and their potential molecular effects (e.g. inflammation). "Currently, there is a common assumption that the small size of nanostructures allows them to easily enter tissues, cells, organelles, and functional biomolecular structures (i.e. DNA, ribosomes) since the actual physical size of an engineered nanostructure is similar to many biological molecules (e.g. antibodies, proteins) and structures (e.g. viruses)" explains Chan. "A corollary is that the entry of the nanostructures into vital biological systems could cause damage, which could subsequently cause harm to human health. However, a number of recent studies have demonstrated that despite the size of the nanostructures they do not freely go into all biological systems but are instead governed by the functional molecules added to their surfaces." Although researchers can now engineer nanostructures to direct the intracellular or in vivo biodistribution but the final metabolic fate is still unknown, and strategies for avoiding secondary unintentional behaviors are lacking. "Overall the relationship between size, shape, and surface chemistry of nanostructures and their correlation to intracellular and in vivo bio-distribution is unknown" says Chan. "By contrast, pharmaceutical strategies have developed this sort of relationship for a number of drugs and carriers and thus, they have created predictive categorization which will need to be emulated with nanostructures. Systematically, one cannot predict the movements and location of nanostructures after intracellular or in vivo exposure based on nanostructure properties at this time, and such studies must be done before one can assess the toxicity of nanostructures in a systematic format." (4) they enter the cells of the organ and reside in the cells for an unknown amount of time before leaving to move to other organs or to be excreted. of engineered nanostructures. "In our view there is an urgent need for conducting pharmacokinetics studies as a first route for assessing nanotoxicity" says Chan. "The information obtained from such studies identifies the cells that take them up, which could logically lead to more focused studies. These specific studies will identify the organ that could potentially be stressed by exposure to nanostructures and will provide a molecular basis of the stress. If one can associate these responses to specific types, surface chemistry, size, shape, aggregation and composition, then we would be able to correlate the toxic responses to the properties of the nanostructures." Chan notes that it will require a progression of studies to fully assessing the impact of physicochemical nanostructure properties. 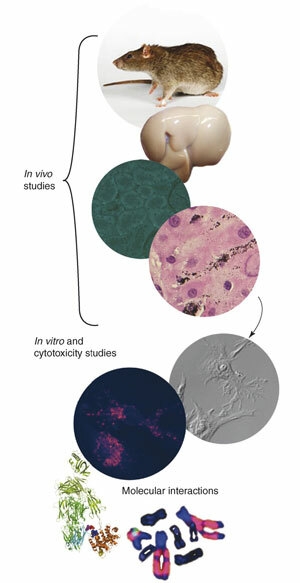 Once the specific organs and cells are identified in connection with a toxic response, further focused studies using in vitro models (e.g. cell culture) would complement the in vivo studies. "Currently, most studies in this area of research utilize cell culture models, in which the results could only be considered as exploratory" he says. "The combined results from multiple studies of different cells in vitro cannot be assumed to capture the same behavior as the same cells arranged in situ in an organ." Chan and Fischer point out that in vivo studies of nanostructures provide new challenges to how pharmaceutical sciences traditionally conduct pharmacokinetics research. They emphasize that detection strategies must be capable of quantifying all of the major parts of a nanostructure in tissues and organs since many modern nanostructures are engineered with multiple components. "Techniques must be flexible and tailored to the specific nanostructure being investigated, and the investigators be cognoscente of the correlation between chosen metric and actual interpreted quantity. Multi-indicator techniques, in which each of the three components listed above would incorporate distinct markers, would provide a complete picture of metabolic processes but this has not been applied to nanostructures." Another considerable challenge is the variability in manufacturing methods, associated raw materials, and reaction scaling necessary to produce adequate volumes of uniform nanostructures. "Consistent particle properties and a classification scheme to support it are necessary to be able to make cross comparisons between the results obtained from different research groups" says Chan. "Once the detection and synthetic challenges are overcome, significant infill of data is required to construct an accurate picture of what variables influence nanostructure pharmacokinetics and whether toxicity will be observed." Finally, the authors stress that another major challenge with nanostructure in vivo studies is understanding how proteins interact with nanostructure surfaces: "In order to qualify observed in vivo results, an understanding of the nanostructure protein-interface is vital, since this can potentially dictate behavior in vivo" (as illustrated on the right).